Blue dress by Edvard Munch. OSLO, NORWAY.- Three works by Edvard Munch were recovered after they were stolen Sunday from the restaurant at the Refnes Hotel in Moss, around 30 miles from Oslo. This makes it the second theft of Munch's work in seven months. According to Iver Stensrud from the Oslo police, they made several arrests, but gave no further information. 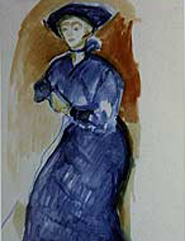 The works that were recovered are the watercolor "Blue Dress" from 1915 and two lithographs. According to Jan Pedersen from the local police, it would be hard to give an estimate on the value of the works. Experts have guessed the value in the hundreds of thousands of dollars. Sunday night a hotel worker surprised two people taking away the works. Pedersen said, "They dropped one, and broke the frame and glass, but took the picture. There are no grounds for assuming any connection between the thefts, but we will be talking to the Oslo police about it." The men who took the works were described as being in their 20s, of medium height and having dark hair. According to Widar Salbuvik, owner of the hotel, the works are part of a 400 work collection, which includes four more by Munch. The hotel is on the island of Jeloey, where Munch lived and worked from 1913 until 1916, when he moved to Oslo.